Last year I bought two small blueberry bushes, which both had flowers at the time of purchase. I brought them home and planted them on either side of our considerably large yard, thinking I'd end up with better spacing that way. The flowers, which had already been pollinated, turned into berries, and I thought the plants were doing well. This year, one of the plants has died, and the other, while still very healthy, has not produced flowers OR fruit. 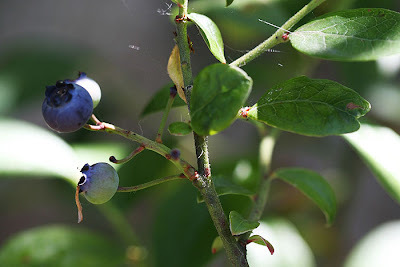 What I'm learning now is that blueberry bushes are not self-pollinating, and need to be planted close to each other so that they can cross pollinate. While blueberries have both male and female parts, they are self-sterile and cannot be pollinated from their own pollen. Bees are important for blueberry pollination, and they prefer warm sunny weather. Next spring I plant to purchase more plants and put them within close proximity of each other, in a sunny, bee-friendly location. Hopefully this will produce better results!